built-in ant moat, and comfortable perches for feeding! Hummingbirds will stay longer at this feeder because of its specially designed high perch that provides birds an anatomically comfortable position for feeding and also an unobstructed view of the surroundings. 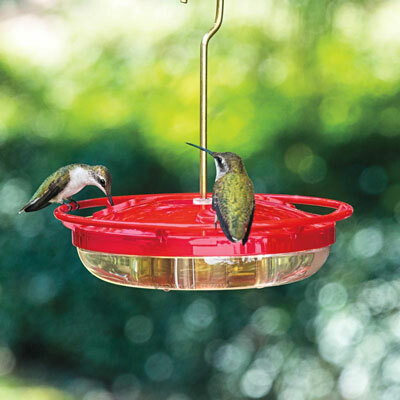 Made of virtually unbreakable polycarbonate that is dishwasher safe, it has a built-in ant moat, a brass hanging rod that won't rust, a clear bowl that lets you see the nectar level, and a red cover (hummingbirds are especially attracted to red!) that lifts off for easy cleaning and refilling. The cover even has 3 raised feeding ports to divert rain! Your birds will love it! Holds 8 oz. Bowl with lid is 7" wide, 2" deep.